Opera Australia Artistic Director Lyndon Terracini, Australian impresario John Frost and leading UK theatre producer David Ian today announced the 18 young performers who have been cast in the upcoming production of Tim Rice and Andrew Lloyd Webber's EVITA at the Sydney Opera House from September. Three sets of six children will alternate in ensemble roles. 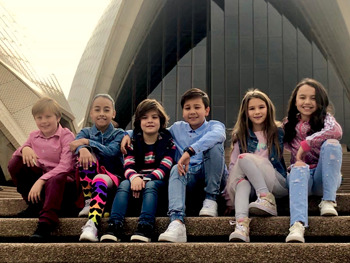 The young actors are Jack Barton (aged 10, of Maroubra), Alysiah Carlino (12, Alfords Point), Julien Daher (8, Queens Park), Jacob Drew (11, Mosman), Paige Hewlett (9, Balgowlah), BeBe Liu-Brennan (8, Strathfield), Robbi Morgan (9, Hornsby), Allerah Murdock (10, Condell Park), William Oakley (12, Woodcroft), Pamelia Papacosta (11, Earlwood), Benjamin Park (10, Strathfield), Sara Petrovski (11, Peakhurst), Raffaella Reid (8, Bellevue Hill), Avaleigh Rock (10, Hurstville Grove), Amelie Rose (9, Allambie Heights), Austin Taylor (10, Balgowlah), Oliver Trus (10, Darlinghurst) and Zoe Zantey (9, Sans Souci). One of the most celebrated musicals of all time, the original West End and Broadway production of EVITA, directed by Hal Prince, will return to Australia from 13 September this year, playing at the Joan Sutherland Theatre at the Sydney Opera House for a strictly limited seven week season. Due to huge demand, new tickets go on sale on Friday 27 July at ticketmaster.com.au, with pre-sales from 23 July. The children will be joining a stellar cast led by Australian singer, songwriter and musical theatre star Tina Arena who will play the role of Eva Perón, opera superstar Paulo Szot as Juan Perón, and Kurt Kansley as the young revolutionary Che. Michael Falzon will play tango singer Magaldi, while the role of Perón's Mistress will be played by Alexis van Maanen, making her professional debut. Jemma Rix will be the Eva Perón Alternate at certain performances. Completing the cast are Justin Anderson, Anton Berezin, Michael Camilleri, Olivia Carniato, Rachel Cole, Alie Coste, Jade Coutts, Kristian Crowe, Todd Dewberry, Rodney Dobson, Samantha Dodemaide, Laura Field, Zoy Frangos, Ashleigh Gurnett, Kate Maree Hoolihan, Georgina Hopson, Thomas Johansson, Kathleen Moore, Thern Reynolds, Christopher Scalzo, David Sirianni, Tod Strike, Simon Tichelaar, Dean Vince, Rachael Ward and Paul Whiteley. The Australian premiere was secured exclusively for Sydney by the NSW Government's tourism and major events agency, Destination NSW, and will be a major drawcard for visitors to the State.